Since organic watermelon is so refreshing, experimental watermelon recipes are becoming more popular every year. Nothing says summer quite as much as the burst of flavor you get when biting into a fresh slice of watermelon. With the official start of summer being just a few weeks away, deliciously-ripe Maryland watermelon is soon-to-be in a grocery store near you. When you buy a locally-grown, organic watermelon, you are ensuring that every watermelon recipe you try this summer will be the best one yet. Since organic watermelon is so refreshing, experimental watermelon recipes are becoming more popular every year. This summer, buy the tastiest watermelon you can find by opting for Maryland-grown, organic produce. This recipe has been a popular one in recent years and for good reason. The fiercely fresh combination of watermelon and fresh mint is unmatched. When paired with cool feta cheese, the marriage of all three flavors is a match made in summer recipe heaven. You can make this into a simple salad or you can make a fancy appetizer by threading them through skewers. Drizzle some balsamic glaze on them for a sweet and salty finish. 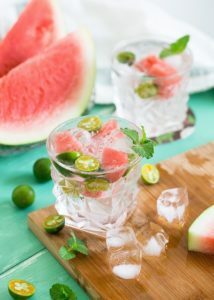 Watermelon isn’t only a great snack or appetizer, it also serves as the perfect base for a summer drink. When opting for a virgin watermelon drink, blend watermelon chunks, frozen strawberries, pineapple juice, and cream of coconut with three cups of ice. If you want to spice it up a bit during a summer party, try a blended watermelon and mint margarita with your favorite tequila. These drinks are the perfect way to cool down on a hot summer night! Grilled watermelon? It may sound odd, but it’s no secret that everything is better grilled — including fresh fruit! The fresh, sweet flavor of watermelon and salty prosciutto creates the perfect sweet and salty pairing. A mild goat cheese is the ideal creamy, bright-flavored addition. Again, drizzle with a bit of balsamic glaze, and your dinner party guests will be coming back for more. This entry was posted on Friday, June 1st, 2018 at 1:30 pm. Both comments and pings are currently closed.